​The first race of the season and it couldn’t come quick enough! Its been five months since my last race, the Redbull Foxhunt, so to end last season on a win and to start this season on a win is a real confidence boost for me. This weekend I was down in the Nagles, Co.Cork for Round one of the Polygon Grassroots Enduro Series supported by BikingDirty.com. Its always cool to race in new venues, so the two and a half hour drive down to Cork in the van with Will Powderly and Cregor Elliot was entertaining to say the least! Three big excitable kids chomping at the bit to get racing again! ​Stage 2 was the longest stage with a long fire road sprint that made me grateful for the winter interval training and gym sessions I had been doing. This is where it really counts. Explosive power is needed to keep going on these sections. Starting on this stage with fresh legs was a good decision and paid off as I finished with a 10 second lead. Stages 1 & 3 were the more technical stages with some steep shoots, drops and tight technical sections through the trees. With the rain coming in, they were starting to get pretty slick and not much time could be gained on a second run. I raced stage 1 and 2 once and as I caught someone on stage 3, I needed to repeat my run to really smash it. I would have raced it a third time as I loved it so much! Would definitely head back to the Nagles to ride this stage again. Happy with how the race went, I certainly didn’t think I had done enough to take the win and to finish 34th overall so I was pretty surprised when handed my results. It was a great way to start the season, and is rewarding to see the hours I put in over the winter paying off. Still have plenty to work on – fitness, physical and mental strength as well as skills – you can never do enough! Well done to all the girls I was up against, especially to Leah Maunsell and Lorraine O’Sullivan who I had the pleasure of sharing the podium with. 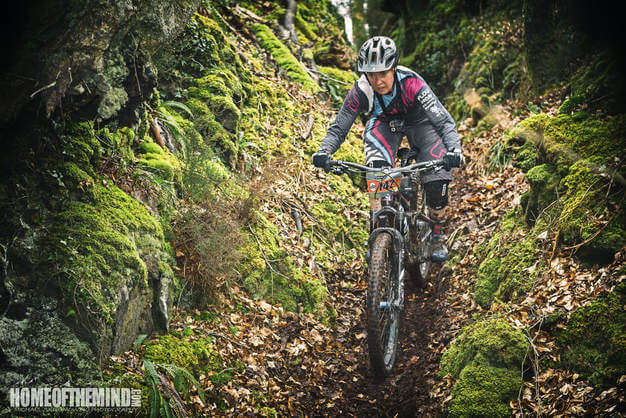 Awesome work put in by the MBCC crew down in Cork and to BikingDirty.com for a really fun race!